Grab your opportunity to play like Manchester City Players in Manchester, UK! Malaysia’s reputed and trusted Male grooming Brand “Dashing” is proud to announce the 2nd season of DASHINGgoesMANCITY contest. Continuing the success of the 1st season, the 2nd season of the contest is going to be bigger and better like never before. Dashing is going to choose 11 lucky winners to experience the ultimate football experience to play like a Manchester City player for 3 days. Dashing is all set to reward the football fans in Malaysia by providing a once in a lifetime opportunity to be a part of 3 days football training camp at MCFC training ground with the MCFC official coach. A simple SMS upon purchase of any Dashing or elite products can make you win 6 days and 5 nights tour in Manchester, UK with return flight and free stay. Not only that, winners will get a chance to meet the 1st team players, watch big matches in VIP seat in a whole VIP experience of Mancunian suite. Dashing is announcing 11 winners for this campaign making Dashing Team of 11 to experience this lifetime event in UK. This is an experience which money can’t buy and certainly a dream come true for any football fan. If you are DASHING user, don't miss out this chance to join the contest! Rishi Pahwa, Marketing Manager for DASHING, said: “Dashing is the only Head to Toe Male Grooming Brand in Malaysia that allows young modern men to exude confidence and become Dashingly cool. The 1st season for Dashing Manchester city contest was very successful and realizing the love and passion for football and especially BPL, we are proud to present DASHINGgoesMANCITY Season 2 contest whereby we look to reward DASHING users with an ultimate footballing experience. To bring this opportunity to every single football fan; the contest has been kept very simple in the form of SMS and Win with no restriction on purchase. Have you ever dreamt of playing alongside the Manchester City players? In this 2nd season contest, the once in a lifetime VIP experience is heightened with the opportunity to train like a Manchester City player in an exclusive 3-day football camp conducted by the Manchester City’s FC. 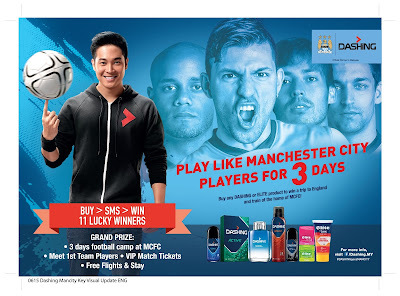 This golden opportunity is brought to you exclusively by DASHING, Manchester City’s official partner in Malaysia. The contest kicks off this July and will run up to December this year. This is a 6 month campaign and the winner announcement will happen in two phases. The first phase will be from 1st July to 30th Sep 2015. The first round of 5 winners will be selected in early October. The second phase will run from 1st October till 31st December 2015 and 6 winners will be announced in the early January. A total of 11 winners will experience 6 days / 5 nights trip to UK to experience this ultimate footballing experience in February 2016. This is an SMS and WIN contest. Win this exclusive opportunity with a few simple steps. Consumers can participate in this contest on buying any product of DASHING or Elite at any participating outlet in Malaysia and partake in a SMS entry competition. To encourage more participation and make dream come true for all Football fans in Malaysia there is no restriction on amount or no. of items that needs to be purchased for participation. Even a single product purchase of Dashing (Price starts from RM 5.1) or elite (Price starts from RM 3.5) you can participate in the contest. To enter the contest, consumers would need to Type (DASHING)(receipt date DDMMYY)(receipt amount RM0.00)(12 digit IC No. )(name) and send to 36266 (Example: DASHING 150715 RM4.55 890808145577 Zaini Daud). One receipt is only entitled to one participant and one SMS entry. Multiple purchases with multiple receipts can make you send more SMS. So, the more you buy, the more you get closer to your favourite EPL matches. Please note that the original receipt needs to be kept till the end of winner announcement. Contest Period: 1st July 2015- 31st December 2015. For more information, you can visit www.facebook.com/Dashing.MY or call the helpline number 0380238311. So what are you waiting for? The time is now for you to celebrate your passion for football and bring out the inner Manchester City football star in you with Dashing, the leading Male fragrance brand in Malaysia.